Almost everything that you buy these days appears to be a multi function device, meaning that you go out to buy a phone, and come back with a camera phone, even though you may never use the camera! These products are normally designed to work in conjunction with each other, like media devices, kitchen appliances and actually almost anything that you should care to mention. However sometimes a product comes onto the market that is multi function, yet works so well it makes you think why didn’t they do that before, that can be said about the DXG Roadster digital camera. The DXG 521 (Roadster) is no gimmick this is a serious piece of kit, that offers some real quality features which is why this so interesting. 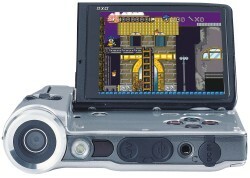 The Roadster is fairly small in size L 4.75”, H 2.25” and D 0.81” it is hard to imagine the amount of technology crammed into such a small frame, yet this device offers the ability to take pictures, capture video, record and play movie & music video clips, play games, listen to FM radio and finally record digital voice recordings for those times when you are just so busy to even write a note down on a piece of paper. Normally the problem with multi function devices is that they are never really good at any of the functions provided, yet the Roadster blows that theory right out of the water, because it has controls that are easy to use, no complicated buttons, switches or displays which make it a real chore to operate. It would appear that this camera has harnessed the best parts of all the functions which improves the usability of this device, after all there is nothing worse than having any product that offers so many features, but when you get around to using them it is to hard or the quality is not that good, the DXG Roadster is an exception to the rule. The DXG Roadster will cost around $200, not bad for all those devices rolled into one.